Armistice Day again – the second year away from home. Let us hope it will be the last. This afternoon Bert Rutledge and I went down in our Jeep to the 8th Field Ambulance. we came home with a gallon of Dettol, a pound of Sulphanilamide, eight hot water bottles and a hundred and fifty syrettes – part of the spoilt of a box which I brought home from Dieppe, and the 8th picked up at Newhaven. I am going down on the 16th to speak to the Unit on Dieppe. No mail yet. 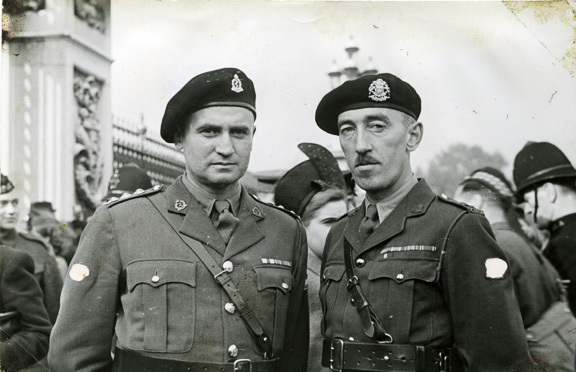 For their actions at Dieppe during the raid, Doc Alexander received the Military Cross for devotion to duty during the Dieppe Raid and Lt.-Col. John Begg, the Distinguished Service Order. The next morning after breakfast, we walk across Green Park to Buckingham Palace, where we line up in queue outside the railing. At 10 a.m. we file through the archway to the Inner Court, and then into the Lobby of the Palace where we are divided into rooms, according to our decoration. We are given instructions, the hooks are hung onto our tunics, and we get lined up in proper order. At 11 a.m. we start in, in single file, into a long chamber filled with an audience. There is a raised platform in the center of the room and we march towards this. The wide glass doors open and the King steps in, the National anthem played, and the King invites the audience to be seated. As our names are called, we step forward onto the platform in front of the King. We halt, turn left, bow, step forward in to the triangle, where the Kind is standing. He pins the medal on and talks to each person for a second. To me, he said “which beach did you land on, Red or White?” I told him both. Then he asked me if we had many casualties: when I told him, he asked me if I had got them all off. 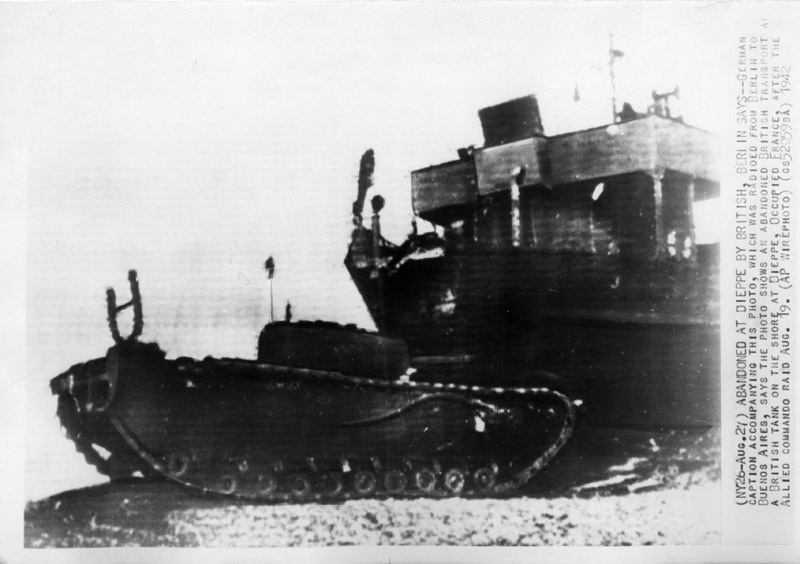 Lord Louise Mountbatten whispered something to him, which I imagine was about our ship – then he asked me what had become of all our casualties and when I told him so many had been blown overboard, he said “It was a dirty show, good work, congratulations.” Then shook hands, I bowed and walked off. On going through the door, another man removed the medal, put it in a case and handed it to me. We had to wait for an hour and a half, until it was all over. Then the National Anthem again, the King went back inside and we all left. John (Begg) and I were photographed outside the gates of the Palace on leaving, then back to the Hotel, where his sister-in-law and her son joined us for lunch – then went to Parliament Buildings, then to the Grosvenor for dinner and then home. 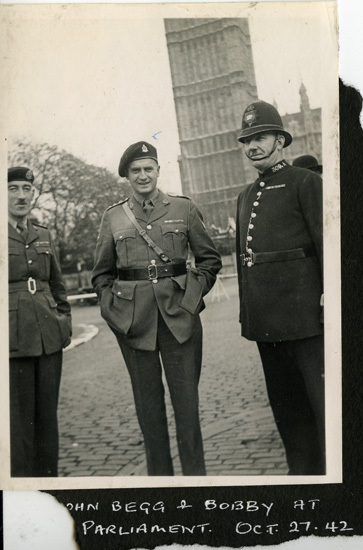 Doc Alexander and Lt.-Col. John Begg outside the gates of Buckingham Palace (top) shortly after the investiture ceremony. Alexander received the military cross and Begg the distinguished service order. Begg and the Doc at the parliament buildings (above). Alexander family collection. Sick parade finished. I am all dressed and ready to start for London for the Investiture at Buckingham Palace tomorrow morning at 10 a.m. John and I go together. We arrive in London at noon and go at once to our rooms in Mayfair Hotel; I go out to Harrods and John goes CMHQ. In the evening I go to Saville Theatre to see Stanley Holloway in Fine and Dandy. After the show, the two girls Irene and Nora, my guests at the Investiture arrive and we all go to dinner at the Mayfair and then to the supper dance. Col. Mataoe – new O.C. (officer commanding) of 2nd Field Ambulance inspected our R.A.P. (Regimental Aid Post) and stayed for dinner. Recieved my notice to report to Buckingham Palace on Oct. 27 for Investiture. John and I will go up on Monday and return Tuesday night. I also was nominated by the DDMS to address the Brighton Medical Society on Oct. 29 – subject “The experiences and impressions gained by a Regimental Medical Officer on the Dieppe raid.” Tonight Mrs. Harrison is holding a house warming party and tomorrow morning I got to London to meet Marje Florendine at Paddington Station at 3:45 p.m. Quite a week.